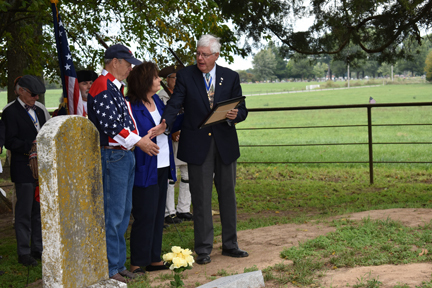 John and Billie Fulton hosted a veterans rededication ceremony at the Catts-Crawford Cemetery on their farm just outside of Mt. Vernon on Saturday, Oct. 6. About 155 people attended the ceremony, including members of the Sons of the American Revolution, Society of the War of 1812, Daughters of the American Revolution and many others. The ceremony included the signing of the National Anthem, a musket salute, and statements made by speakers dressed in historic military garb. Following the ceremony, guests were invited to the Fultons’ house for lunch and other activities. 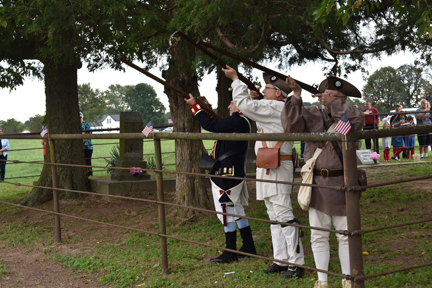 Right, from left, Steve Perkins, Frank Furman and Don Turner prepare to give the musket salute at the close of the ceremony. (Photos by Steve Chapman) George Swales, president of the Ozark Mountain chapter of the Missouri Society of the Sons of the American Revolution (right) presents John and Billie Fulton with a flag certificate during the veterans rededication ceremony.